An understated establishment devoted to a somewhat misunderstood painter, the Musée Henner had closed its doors in 2005 for a complete renovation. It reopened to the public last Saturday, 7 November. The refurbishment did not consist only in reinstating the III Republic aspect of this former private residence, but also entailed the restoration of many of the paintings and those frames which had been removed in the 60’s and which were found lying in the basement. We will be straightforward in stating that this renovation has been magnificently achieved. It proves that if done with taste, and with a curator who cares about heritage accompanied by an architect who intervenes unobtrusively in a historical site, it is possible to bring an old building up to modern standards without massacring it. Even if the residence has been “hennerised” to render it fitting for the tribute to Jean-Jacques Henner, it would be wise to remember that this was not his home but that of another painter, Guillaume Dubufe . 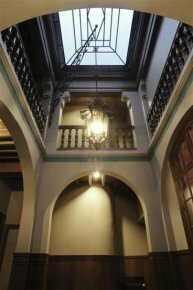 The restoration of the building paid careful attention to the reconstitution, without falling into the excesses sometimes found elsewhere, of the atmosphere characteristic of an artist’s residence. 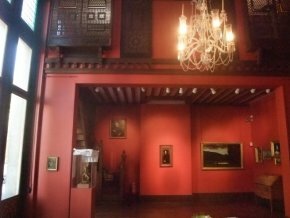 The colours of the walls are as close as possible to the original (ill. 1), some of the décors by Guillaume Dubufe have been re-enhanced (ill. 2) ; the dining-room on the ground floor to the left of the entrance hall, previously occupied by security personnel, has been opened to the public ; the old elevator located at the heart of the building, mutilating the volumes, has been replaced by another one which is much more discreet while still providing access to the handicapped . One hundred thirty works are on permanent display, which might not seem much but remains justified. Although a very dense hang is generally preferable to relegating works to storage, the issue changes entirely when it concerns a museum devoted only, or almost, to one artist alone. Most of the large formats are on display, but it would have been a bit overbearing to present hundreds of Italian landscapes side by side. A selective choice therefore was needed. Only the second workshop, on the last floor, offers a rather monotonous hang on one wall, which is not too serious a matter. 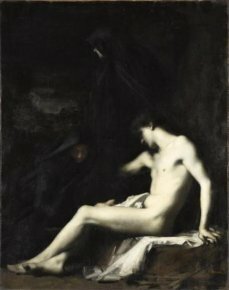 In the same room (ill. 3), other walls present several large formats from the Salon including the very beautiful Saint Sebastian, Prud’hon-like, of 1888 (ill. 4). 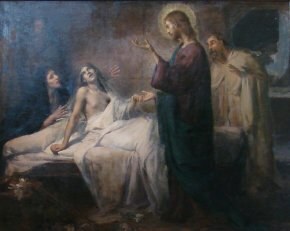 There are also see two recent acquisitions, paintings by Emmanuel Michel Benner, known as Many Benner, a student of Jean-Jacques Henner, donated in 2007 by his family, a Saint John the Baptist as a Child and a Resurrection of Jairus’ Daughter (ill. 5) . Visitors will be sure to appreciate a very comfortable sofa allowing them to take in the works at leisure, a rare luxury, alas, in most museums which tend to give the impression that it is impolite to sit down and take your time. One room will highlight periodic offerings of drawings or engravings. Henner himself owned some works by his contemporaries (they can be seen in the formal workshop on the first floor). He also collected engravings and the first exhibition of graphic art (until 8 February 2010) will present the complete set of Goya’s Bullfighting held by the museum. The exhibition recently organized by the Musée Henner and the Musée de la Vie Romantique, a prelude to the current re-opening, was reviewed in our journal by Jean-David Jumeau-Lafond (see article). The result of the restoration of the Henner works in their new setting confirms in any case the fact that the public would do well to erase the poor image often held of this artist, distorted by the many fakes found on the market. 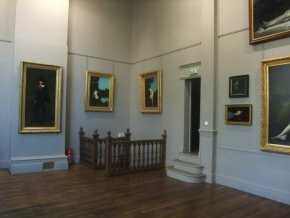 Although not a genius, Henner is a fine painter and some of his works are well worth the visit to this small and very charming museum. Visitor information : Musée Jean-Jacques Henner, 43 avenue de Villiers 75017 Paris. Phone : 00 33 (0)1 47 63 42 73. Opening hours : 11.00 to 18.00 every day except Tuesday ; open until 21.00 the first Thursday of each month. Rates : 5€ (reduced : 3€). Free entrance conditions are the same as for other national museums. Dubufe had bought it from the painter Roger Jourdain (1845-1920) ; it was then acquired by Marie Henner, the artist’s niece, to install the collection she donated to the government. We would like to point out that the renovation is not entirely finished : Guillaume Dubufe’s winter garden, where an 1878 mosaic has been uncovered on the floor, still needs to be restored. Cf. La Revue des Musées de France – Revue du Louvre, n° 2, April 2008, where these paintings donated by Jean-Charles Benner were published. Three other works were included in the same donation : a Seascape, Bethsaida’s Pool and Piffefari.